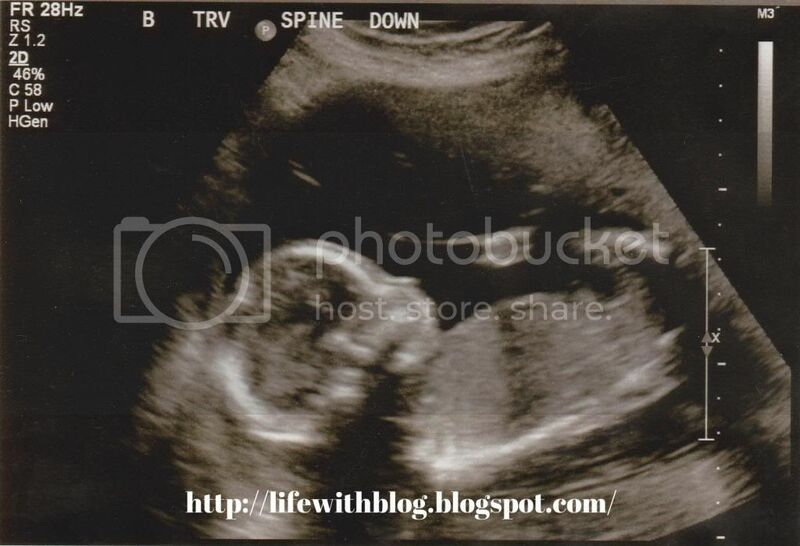 Life with Blog: 20 Weeks Today! 20 weeks. Yikes! That went by fast. 20 weeks is the halfway mark of a full term pregnancy, which is generally considered to be 40 weeks. According to several googled sources, the average twin pregnancy is about 36 weeks. Of course, there's really no telling what will happen or when, but fingers crossed, doctors orders followed and hopefully, these boys will be patient and grow as much as they can before joining us. In the last week or so, I've really been to feel them moving. Though it's mostly the 'popcorn' type that I've felt, there has been one or two good hits. And once, I felt them at the same time. That was quite strange. 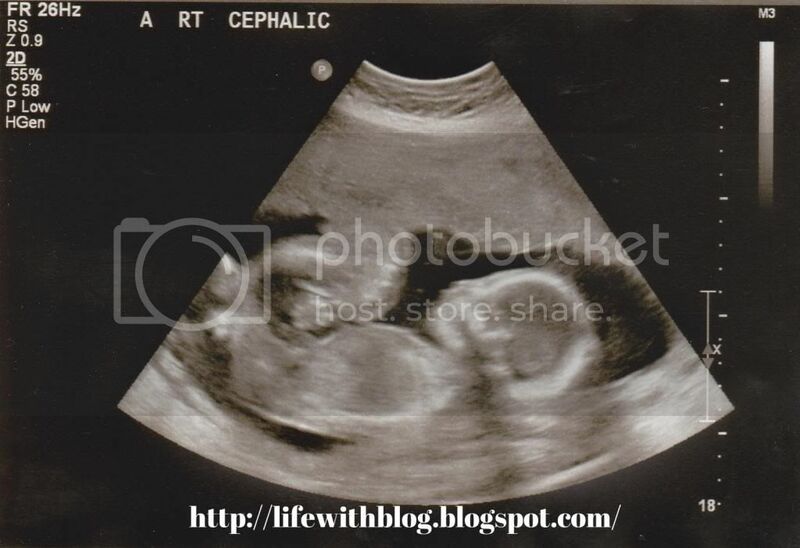 At my latest ultrasound on Friday, they measured right on track, good heartbeats and both weighing about 12 ounces. Baby A still has his hands in front of his face but he had turned just enough for the tech to manage getting the needed images. Baby B had given us all but a good view of his feet the first time and is still not giving those up so we'll try again in another 2 weeks. As for me, well, growing two people while chasing a toddler seems to be a lot more energy draining than I thought it would be. Another major difference, though expected, has been my clothes. With Keira, I wore most of my regular clothes right to the end. Not with these guys. My jeans have already been resigned to the drawers until further notice and many of my shirts will remain in the closet. I've been shopping once or twice but haven't found too much luck. Thanks to being only 5'2", most of the shirts tend to look more like dresses, but I managed to find a couple I liked. I'll be much happier when the weather warms up so I can wear more actual dresses. 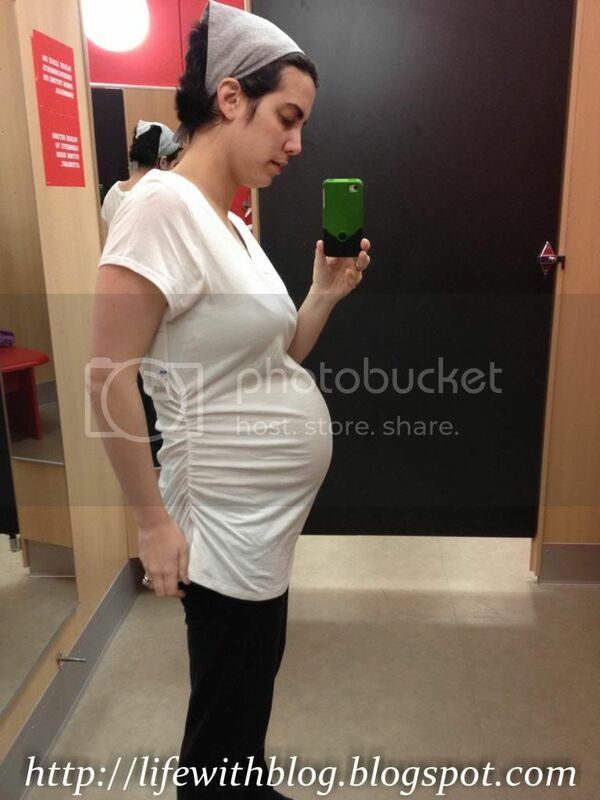 And because I've yet to post a 'bump' pic, here you go: a pic of me, about 20 weeks, trying on a maternity shirt. (I think it's the first pic of my super short haircut as well. I'll have to do a better one at some point). I think you are completely cute-tastic. Have you checked out motherhood maternity? They have their own little section on most kohls as well as stand alone stores.